As Sony fans know only too well, the legendary Japanese company's policy on flagship upgrades dictates a refresh every six months or so. In the case of the Sony Xperia Z3+, however, the device has barely been on the market for two months and there's already a newer, meaner Xperia flagship — the Z5. In many ways, this hurt the significance of the Xperia Z3+, which most people have never seen, nor will buy given the more tempting Xperia Z5. This is why, in a way, the true predecessor to the Z5 is actually the Z3, technically incorrect as this may be. And sure, the Z3+ served as a testing board for some design changes — ones that we also find in the Z5 — but we thought comparing these subtle differences with the Xperia Z3 makes more sense. One of the biggest troubles we had at IFA 2015 was showing off the re-designed front-facing stereo speakers of the Xperia Z5. They are nigh impossible to spot on video! But they're there — at the very top and very bottom, those extremely skinny strips actually seemed to pack quite the punch. While brand insignia etched onto products annoy some people, we found the new Xperia marking on the left side of the frame, towards the bottom, to be perfectly acceptable. Another change to the design of the Xperia Z5 is the button layout — and we're not sure we like this one. In any case, the volume rocker on the right side of the frame is now much, much closer to the physical camera shutter key, both of which are located towards the bottom. This makes volume control more awkward than before, as you have to shift your entire grip (if right handed) in order to reach it with your thumb. As mentioned, one of our favorite changes to the design is the new, frosted glass plate used with the Xperia Z5. It looks great, feels even better, and is well protected against your oily fingers. Praise the Titans, the microUSB charging port of the Xperia Z5 is finally flap-free! Sure, hating on the previous iteration might sound like nitpicking, but we can't help but feel stupidly excited about the removal of the blasted flap. As far as subtle design changes go, the revamped power key of the Sony Xperia Z5, which also integrates a touch-type fingerprint scanner, is among the more obvious revamps. The key is now rectangular in shape, considerably larger, and slightly recessed from the surface instead of protruding. And with that, we wave goodbye to the signature, circular Sony power key. One of the noteworthy upgrades with the Xperia Z5 is a higher resolution, 5-megapixel selfie camera, which is also physically larger. It's now located on the left hand side of the top bezel, and is more adequately matched with the ambient light sensor in terms of size. Another Sony staple, the magnetic charging port typically located on the left side of the device, allowing you to easily charge the device, is gone with the Xperia Z5. Now that there's no flap covering the microUSB port, however, that's probably for the better — while practical, it's definitely unsightly. 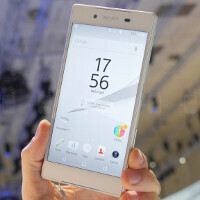 They did a good job at refining the design, I like that Xperia logo on the side. But they really should come up with a new design for their next flagship, we need something new. Otherwise they will go down like HTC. It might mean that they're preparing for wireless charging in the near future. While that is true, I am loving the frosted green back. Yeah, me too. It looks cool. i hope not. i'm tired of good designs being demonized because the market is fickle. imo the m9 and the xperia z5 are pretty much everything i want in a phone except the 810... i just can't do it. so if i could have a custom m9 with the 820 in it and no other changes... i'd go for it. perhaps type c port but really that's not a make or break to me yet. I understand. But you know, I really miss the days when we first saw the Xperia Z getting unveiled, the design really wow me that time. I miss that wow from Sony. And next year MWC might be your lucky day since rumors are saying that there will be a Z5 Ultra with Snapdragon 820 and I doubt that the design will change much. Hell no dont fix what aint broke. The only improvement they should do is smaller bezels and maybe make it thinner. Dont ruin it. I've always wondered... Do you guys really think we get paid to stealth promote? Hilarious. Leave them Chris, these are kind of people that only want one brand to dominate. They don't understand that competition is good and Sony is actually trying this time. Yup I totally agree with you. Considering that it's against FTC regs to have sponsored native content without it being labeled as such, I rather hope not. I absolutely detest the new placement of the volume key. It should be on the left side. This placement makes it impossible to change the volume with one hand if you're holding the phone with your right hand( which is what most of us do). But while using camera it's the perfect place for zooming.. I'd rather zoom using pinch to zoom. Plus, I'd you're shooting a pic, you're holding your phone with 2 hands. In that case, all the corners of the phone are pretty well accessible. I Wonder If They Keep The Same Design With Only Slight Changes Because Its Hard To Design A Good Looking Slim Phone That's Also Completely Waterproof........???? ?